Make connections quickly and reliably with these screwless spring terminal breakout boards, which feature terminals made by Phoenix Contact. 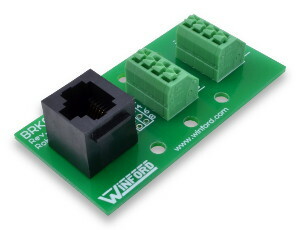 These RJ45 breakout boards bring all 8 pins of an 8P8C (RJ45) modular jack out to spring connection terminal blocks for quick, easy, secure connections. Each connector pin is also brought to solder pads which can be used as test points or for the addition of soldered components. The solder pads are arranged on standard 0.1" spacing, supporting the addition of soldered components such as pin headers. Please note that the breakout boards are manufactured with a connection between each connector pin and the corresponding terminal block position; no soldering of any type is necessary. 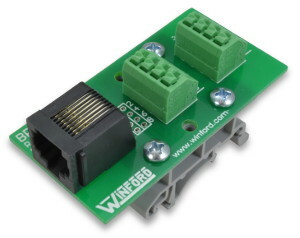 The solder pads simply provide an area for making optional connections to additional headers or other components. 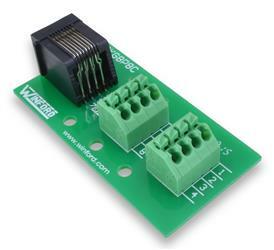 This breakout board features push-in spring connection terminal blocks. 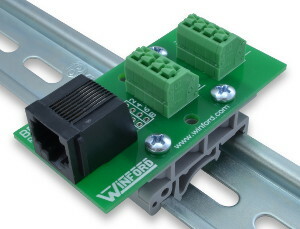 These screwless spring clamp terminal blocks allow connections to be made very quickly and efficiently. The spring terminal connections are reliable and secure, but wires can be connected and disconnected in a fraction of the time required with standard screw terminal blocks. Simply depress the actuator button on top of the terminal block, insert or remove the wire, and release the button. Done! In addition, screwless spring connections can offer better results in environments where vibration could potentially loosen standard screw terminal block connections. If your application requires screw terminals rather than spring terminals, please consider the BRK8P8C design or the other 8P8C options listed here. This break out board is perfect for production applications as well as experimentation and prototype work. It is well-suited for work with RS-232 serial ports, data acquisition equipment, and any other device that uses an RJ45/8P8C connector. It can be helpful in making MODBUS connections. A breakout board is sometimes referred to as a "transition module", "terminal board", "terminal block", "breakout box", "breakout adapter", "terminator", or "interface module". Approximate dimensions: 2.75" x 1.35"